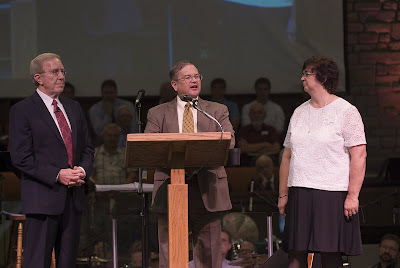 Jim Custer (left), longtime pastor of the Grace Brethren Church of Columbus (Worthington), Ohio, officially passed the leadership baton to Dr. David Plaster (center) at the installation service for Plaster on September 30 (Bill Palmateer photos). Plaster’s wife, Ginny, is at right. David Plaster previously served in teaching and administrative roles at Grace College & Seminary in Winona Lake, Indiana. Custer has pastored the Columbus church since 1968.